Thyme Training has been re-launched by Mary Mackle & Co, Chartered Accountants who have more than 20 years in practice. We have undertaken extensive training and examinations to become a Sage Accredited Accountant Partner. We are located at CIDO Innovation Centre, Portadown where we have offices, interview rooms and training suites and can offer in-house catering services. Our premises are located at Junction 14 on the M1 and less than 30 minutes from Belfast. We pride ourselves in the personal service we give to our clients and offer a competitively priced range of services including Accounts Preparation, Audit, Tax & Company Secretarial. We use Sage packages in our practice to help us provide efficient and cost-effective services to our clients. We have a varied portfolio of clients using Sage and have worked with them in implementing and maintaining Sage accounts and payroll programs for the past 20 years. Our in-depth knowledge of the Sage 50 Accounts and Payroll packages, together with our expertise and experience as professional accountants and tax advisors, enables us to provide effective solutions ,saving time and ensuring compliance with legislation. Sage 50 Accounts and Payroll will also provide you with management information to help you make decisions to keep your business ahead in these difficult times. You can buy on-line from our shop or contact us for pre-sales advice to help you choose the right product. Our Customised Training is designed to assist you in getting the most from your software and can be purchased as an Optional Extra with Sage 50 Accounts and Payroll packages. Thyme Training also offers Sage Classroom Training courses, Bookkeeping and Payroll Bureau services. We have partnered with BMCA Solutions to provide comprehensive I.T. solutions for our clients. 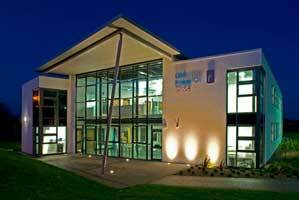 This has now been extended to facilitating official Sage training at our premises in CIDO Innovation Centre. We are delighted to be able to host the only official Sage Training in Northern Ireland. Our prices are competitive and we guarantee discounts on upgrade prices. We always have Special Offers which make our prices even more competitive. Thyme Training offers much more than a boxed solution . Our pre-sales and follow-up support and installation services offer value for money and will help you get your Sage program working efficiently as a soon as possible. Call us for a quote. We'll try to beat any other genuine quote for Sage 50 and Instant ranges.